You are here: Home / Shaving / Shaving 101: Why Would You Use A Shaving Brush? How Do You Choose One? Shaving 101: Why Would You Use A Shaving Brush? How Do You Choose One? Using a shaving brush can make a huge difference in the quality of your shave. Here is how they work, plus some guidance on the different varieties that are available and which ones may be best for you. Whether you’re using cheap canned shave foam (don’t!) or the most expensive shaving cream, it’s really water that does the “heavy lifting” for a shave, preparing the skin and the hair. But water alone is far too volatile to use by itself for most people (though admittedly some can shave in the shower with just water as long as there is a continuous flow available). Shave products (foams, gels, creams, etc.) exist to stabilize and hold water against the skin–and yes, provide even more lubrication and cushion with additional ingredients. Using a shaving brush further mixes product with water making an even more effective lather for the razor blade edge to track on (and reducing the amount of air in the lather as well, preventing the skin from prematurely drying and possibly causing irritation). Plus the shaving brush usually needs less product to make a good lather: traditional shaving creams and soaps may cost more up-front but you use so little of it at once it will last far longer and the cost per shave can be quite low. Because a shave brush is most often used with a lathering shave soap or cream, using a brush can reduce (replace?) the need for a pre-shave routine of washing or cleansing the skin. Using a shave brush also produces a mild exfoliating effect on the skin: think of it as helping sweep away tiny bits of debris from around hair stubble. Shave brushes may also help lift out stubborn ingrown hairs. When shave products are applied with just fingers, hairs tend to matte to the face, making them more difficult for the razor’s blade edge to get at. When used properly (more on this later), a shave brush lifts hair and surrounds it with lather, requiring less work from the razor. Beyond the more practical aspects of using a shave brush, it can also enhance the shave experience. Ever get a barber shave with the towels and the warm lather? You can get a similar experience with a shave brush. And for some, that feeling of a warm, fragrant lather on the face is very relaxing and appealing. It’s almost a “Zen” or meditative experience. Unfortunately selecting a shaving brush can be confusing to the uninitiated. Let me explain some of the variations. Shaving brushes generally come in one of four types of bristle: boar hair, badger hair, horse hair or synthetic material. The lowest grade of badger hair is generally referred to as “pure.” This grade is characterized by a dark color and thick, relatively stiff, coarse-looking hair. Some manufacturers will bleach the hair slightly to make it appear like a higher grade but the hair itself will still look coarse. The next grade is usually called “super” or “fine.” These brushes are generally better constructed and the hair is finer-looking, softer, and lighter in color. Super badger brushes retain water and heat noticeably better–sometimes dramatically better–than lower grades. The highest grade of badger hair is usually labeled “silvertip.” These brushes are typically made to the highest standard, often with hand-crafted workmanship, commanding the highest prices. Silvertip hair is often cream colored on top with darker bands of color below and very fine but still fairly flexible hairs. These brushes will retain even more water and heat than super badger brushes, but is a less dramatic improvement. Boar hair brushes–sometimes called “natural bristle” brushes–are the most commonly seen in mass market outlets such as drug stores and “mega-marts.” Most of these brushes are not very well constructed and tend to require more work to get a good lather from. However that is not to say that all boar hair brushes are substandard. On the contrary, a well-made boar hair brush may provide years of service and can work quite well after a break-in period. Sometimes these brushes are dyed to look like badger hair brushes. Boar hair retains less water than badger hair but selecting a boar hair brush with a higher “loft” (see below) should help compensate for water retention. Boars and badgers are killed to harvest their meat and hair so if that is a concern you may want to select a brush with synthetic or horse hair. Virtually all badger hair used in shaving brushes come from China where the badger is considered a pest and controlled under license but there is some controversy over how humane the “harvesting” process is. Horse hair shave brushes have returned to the market after a being out of favor for nearly 100 years due to an anthrax scare around World War 1. Horse hair brushes are generally made from the horse’s mane or tail (or a mix of both). The performance is roughly that of a boar brush but it is considered the most “animal-friendly” variety. Finally there are synthetic brushes. These can range from brushes with nylon bristles those with more specialized synthetic material. Their price and performance usually fall between those of boar and badger brushes. However some fairly significant improvements have taken place over the past couple of years and the higher-end synthetic materials are now much closer in performance to quality “super” and “silvertip” badger brushes! The ingredients of some “brushless” shave products (like a gel or a canned foam) may damage a brush’s natural hair so if you are unsure of the ingredient reaction consider using a brush with synthetic hair. Brush dimensions are typically expressed in millimeters and are often divided into three sections: loft, knot, and over-all height. The loft is the length of the actual hair from the top of the handle to the tip of the hair. The knot is an indication of the amount of hair packed into the handle. The knot dimension can be a little ambiguous because hair can be packed tightly or loosely. Finally the length of the handle is factored in to determine the over-all height of the brush. Generally, larger brushes tend to work better at lathering large areas more quickly, while smaller brushes offer more control. Brush sizes cover a very wide range but I think its safe to say that the average loft is about 50 millimeters and the average knot is about 20 millimeters. Brush size and shape are a little more ambiguous. The tips of the loft can be shaped into a fan-like shape (some are essentially flat) or into a bulb-like shape. Each style has their advocates but there’s no real agreement about it. The second is the size and shape of the handle. Size and shape is yet another personal preference, but in the absence of knowing what you want I suggest measuring the distance from the palm of your hand to the pad of your thumb and let that measurement be the maximum length of the handle. You should be able to find a brush with virtually any budget so set yourself a maximum price and stick to it. Bear in mind that many shavers who use shaving brushes eventually get another brush after they have used one for a while and have decided they have a preference for a particular aspect or type of brush. Related Post: What Is The Best Shave Brush? Here is your best opportunity to truly enjoy your shave. It takes (a little) longer to make a lather but it is worth the trouble. NOTE: The first time you use an animal hair shave brush (particularly the less expensive ones) you may notice a not-particularly-pleasant wet animal smell–often referred to by shaving aficionados as “the funk.” This is normal and should go away after a week or so of use. There are some variations on how to make a good lather with different products, and it can take a little practice to get right, but the payoff can be a dramatically better shave. There are two general schools of thought on making traditional shaving lather, differentiated mostly on how water is integrated into the mix. The classic (or “frugal”) method of lather-making starts with minimal water on the brush, adding water until you get the lather consistency you are looking for. The other school of thought, sometimes called “creamy” lather-making starts out with much more water on the shaving brush, letting overflow spill out unused. Neither method is right nor wrong. Try both methods to see what works best for you. 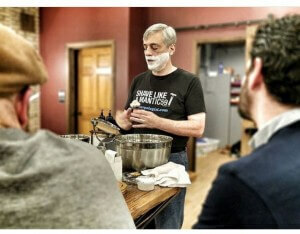 You may need to set some time aside time to experiment as you learn the “art” of lather-making. Don’t worry–once you get the hang of it you can cut that time way down. Making shaving lather the “classic” way starts with soaking both the brush and the cream or soap in water (if you’re using a synthetic material brush you can just swish it in the water, you don’t have to soak it. Though soaking should let it retain heat longer). Fill a sink with warm-to-hot water and place the shaving brush in the sink. How long the brush needs to be soaked is dependent on the type of brush: boar hair, horse hair, and low grades of badger hair (such as “pure black”) need to soak longer (probably several minutes) than higher grades of badger (perhaps less than a minute). If you are using a puck of shaving soap put it in the sink as well (or if it is in a container or bowl put the hot water in that). If you have a jar of shaving cream that has been used for a while it is probably worth pouring in a little water as well. The key point in these circumstances is to loosen the outer “skin” of the product to make loading easier. More on that shortly. If you have a shave soap puck or a jar of shave cream, spin the brush onto it, pressing down slightly, to coat the brush’s bristles with product (an alternative for the jar is to scoop some out with a small utensil and place it directly into the center of the brush). You are looking for more than just a light foam on the bristles–you want a relatively thick coat. If you are using a tube of shave cream, squeeze out an almond-size amount directly into the center of the brush. Building lather: You can do it in an empty bowl of some kind or directly onto the face. An advantage of using a bowl is that you can get a better idea of how the brush is generating lather. And if you gently heat the bowl beforehand you can get a warmed lather than can feel great. On the other hand building lather directly to the face can save some time and help with shave preparation. Massage the brush into the bowl or on the face using circular motions and pressing the brush down slightly. Some advocate using a painting motion vs. a circular motion but let’s start off with circular. Massage for about 30 seconds then dip the tips of the brush in water and repeat. It may take a several minutes for the lather to build on the brush to the right consistency, depending on the type of brush, the type of product used, and the mineral content of the water. Whether you’re building in a bowl or to the face, you are looking for a shiny, somewhat “loose” consistency (runnier than what might come out of a can or brushless tube) with soft “peaks” (like a cake batter) without any bubbles. Once again, while you are doing this, enjoy the scent of the shaving lather. For soap and harder shaving creams: Wet brush fully—sopping, dripping wet—and hold tub of soap over the sink on its side and brush briskly and firmly (enough so that the bristles splay somewhat) until the bubbles being formed are microscopic, at which point the brush is fully loaded. At first, some water and some loose sloppy lather will probably spill into the sink, but pretty soon you’ll see real lather. But keep brushing: the focus is loading the brush, not making lather, and you want the brush fully loaded with soap. Brush the soap until the bubbles being formed are microscopic—creamy rather than foamy—then bring the brush to your (wet, washed) beard and work the lather up and into the stubble, taking your time. If the lather seems a little dry or a little stiff (too much soap), then run a driblet of water into the center of the brush and work that into the lather on your face. I’ve never had lather that’s too wet with this technique, but sometimes I do need to add a little water. I’ve found that the “microscopic bubble” indicator is the most reliable sign that the brush is fully loaded. If the lather’s still bad, suspect hard water and try a distilled water shave. Hard water doesn’t affect shaving creams so much. Note that hard water is not softened by using a Brita filter (which removes particulate matter, not dissolved minerals). Bottled drinking water is hard: hard water tastes better. Then use the brush to spread the cream over your entire beard, so that your beard is coated with a thin layer of almost pure shaving cream. Run a driblet of water into the center of the brush, and brush your beard to work the water into the shaving cream. Repeat as needed until you get the lather where you want it. Again, play around: keep adding little bits of water until the lather’s too wet, testing it perhaps along the way between thumb and forefinger to see how slick it is. Slickness will increase, and then when the lather’s too wet, slickness will fall off sharply. The more you play around with test lathers, the faster you learn to make good lather. It’s safe to say everyone has experienced trouble making traditional shaving lather at one time or another. Here are four shortcuts to making a better, more stable lather, more quickly. A trick similar to “Superlather” is “Uberlather.” Uberlather is the process of adding a few drops of pure glycerin to the shaving brush before lathering with cream or soap. The extra glycerin will create a more stable, longer-lasting lather. Glycerin can be found at your local mega-mart, drug store, or large grocery store, usually in either the skin care or first aid isle. Sometimes lather is not very good because your local water has too many minerals or contaminants (e.g. “hard” water). If you have hard water try mixing in some distilled water. Just heat some up (not to boiling!) and pour it into your sink (with the stopper closed, of course). Another tactic to try for hard water is a small amount of Citric acid. It can often be found with the canning supplies at large groceries and mega-marts. Again, you may need to experiment a little with the amount to add but start out with just a tiny bit–just a pinch of citric acid to a whole sink full of water. Using too much citric acid will change the pH of the water and you may not get any lather at all! Most shavers rinse their brush after every use, though there are some who advocate leaving it loaded. After you’re finished with your shave, rinse the brush thoroughly in warm water, gently “pumping” the water through the brush until it rinses clear. Then–gently!–squeeze the water out of the brush and wipe it on a dry towel, “fluffing” the hair to break up any hair that might be clumped together. Do not shake or “flick” the brush vigorously! Doing so may weaken the glue knot holding the hair into the handle over time: one day you may have a hairy projectile flying through the air! Store your brush in a ventilated area–NOT in a closed cupboard. There are some variables involved but all but the cheapest shave brushes should last you for several years of regular use. Some of the high-end brushes may last a lifetime but most will show a noticeable decline in performance after five-to-ten years. Have I answered all your questions? If not, leave a comment below! The sopping-wet-brush method that I initially used I have abandoned, mainly because it really did not work well on some soaps. It turns out that those seemed to be soaps that contain clay (and clay is used in some very fine soaps). I now always start with a merely damp brush, and add water only as needed. (I in fact learned this from Mantic59.) Here’s a detailed description of how I now make lather, and this method has so far worked with all soaps.